Homes at Stonoview start from the high $300,000s and feature the high-quality construction and innovative designs FrontDoor Communities is known for. Homes at Stonoview start from the high $300,000s and feature the high-quality construction and innovative designs FrontDoor Communities is known for. The Sassafras, available from $374,900, features three bedrooms, two baths and 1,658 square feet of living space. Offering both convenience and charm, the Sassafras is a one-story, split plan filled with thoughtful touches that include high ceilings, an open-concept kitchen with spacious island, a mudroom and optional wraparound porch. Perfect for entertaining visitors, the Sassafras’ split floor design provides convenient privacy between the luxurious owner’s suite and the secondary bedrooms. Priced from $399,900, the Cottonwood features three bedrooms, two-and-a-half baths and 1,824 square feet of thoughtfully designed living space. Perfect for empty nesters or busy families, the Cottonwood exudes function and convenience with its open design and charming green views that highlight the surrounding Lowcountry. The main floor owner’s suite serves as the ultimate retreat with his and hers closets, double vanities and French door access to the rear porch. Featuring three bedrooms, two-and-a-half baths and 1,890 square feet of living space, the Ellis is also priced from $399,900. This open-concept design offers elegant, livable spaces with beautiful porches to form a truly welcoming home. The main level serves as the ultimate entertaining area with optional screened porch and gourmet kitchen overlooking the dining and family areas. An optional office or study space provides the perfect alcove to escape without missing all the action. Two secondary bedrooms accompany the owner’s suite on the upper level with its spa-like bath featuring double vanities, separate shower, optional tub and optional porch. This plan offers the option for the laundry room to be on either level as well as a third-level add-on for an additional bedroom and storage space. Residents at this riverfront community enjoy a multitude of amenities that include a community dock with sundeck, floating boat slips, onsite boat and kayak storage, crabbing, waterfront park and pavilion, community pool and tennis courts. Additionally, Stonoview complements the area’s natural surroundings with its golf-cart-friendly walking and biking trails under canopies of moss-draped oak trees, pocket parks and several picnic areas. Its natural accents provide the ultimate escape to residents, while its prime location also offers easy access to fine dining, shopping and entertainment with downtown Charleston a mere 15 minutes away. Children attend Angel Oak Elementary, Haut Gap Middle and St. John’s High. Stonoview is located at 2627 Battle Trail Drive on Johns Island. To learn more about these exceptional, on-the-water opportunities at Stonoview, visit http://www.FDCCharleston.com/Stonoview, call 843-352-4997 or email Stonoview(at)FrontDoorCommunities(dot)com. 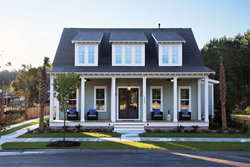 With more than 35 years of experience and communities throughout Florida, Georgia and South Carolina, FrontDoor Communities is known for expertise in developing master-planned communities in high-growth locations. Awards and accomplishments of FDC team members include America's Best Builder and The National Housing Quality Award, among others for design and execution. Before forming FDC, founders Terry Russell and Mike Langella were both leaders of the Southeast's largest privately held home builder. For more information, visit http://www.FrontDoorCommunities.com.